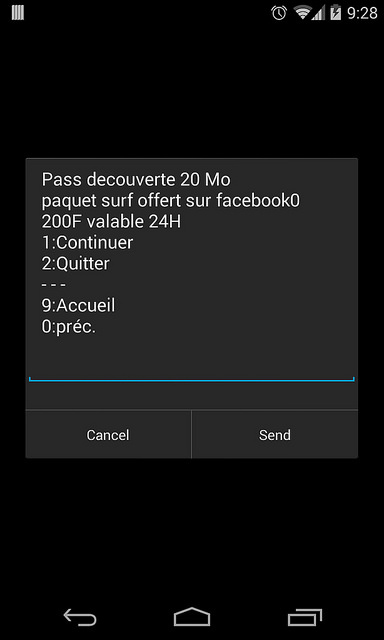 The day I arrived I picked up an Orange SIM card, which cost me 1000 francs (US $2) and came with 1000 francs of credit, and then got my phone’s APN configured for some sweet 3G Internet. So far so standard, nowadays. But then my cab driver kind of blew my mind. Huh. My Dakar cab driver just pulled over to gas up at a Total station…and paid for it with his candy-bar Nokia. "Orange Money" FTW. I apologize for getting all Thomas Friedman on you here. But still. I mean, I knew mobile money was big-verging-on-ubiquitous in East Africa, though M-Pesa–which, incidentally, has just expanded into Europe–but I hadn’t realized that it has grown so commonplace here in the West that it is used by cab drivers at gas stations. You can use “Orange Money” for both payments and transfers, here in Senegal, and even internationally to Mali and Burkina Faso. In fact, across the developing world, where the vast majority of the population doesn’t have bank accounts per se, mobile-phone carriers have, or will, basically become their nations’ dominant banks. Oh, they’re not lending money–yet–but if you allow your customers to withdraw, deposit, pay, and transfer money, then you have basically become, for most intents and purposes, a retail bank. I don’t know how I didn’t notice until now that while software was eating the world it incidentally already pretty much ate most retail banking across a huge swathe of Earth. Unfortunately, its next meal here may be slow to arrive. but as much as I’m sure they’d love to have everyone on the planet walled within their garden, the Internet isn’t particularly useful if its free content consists entirely of Facebook — and/or Google, Wikipedia, Twitter — and everything else remains oppressively expensive. In the long run, now that the carriers here are also the banks, it’s probably to their own benefit to cut data access costs and reap the long-term economic rewards. Let’s hope they see that too. Image credit: yours truly, Flickr. Irrelevant footnote: I have now posted to TechCrunch from no fewer than a dozen different nations, mapped here via World66. (Canada, USA, the UK, France, Turkey, Senegal, Ethiopia, Kenya, India, Myanmar, Cambodia, the Philippines.) Do I win a prize? I bet John Biggs has me beat cold, though.